Coach Bruce Arians’ “no risk it, no biscuit” philosophy on offense hasn’t been big on tight ends. But that might change in 2019 as Arians takes the reins of the Tampa Bay Buccaneers, who have former Alabama standout O.J. Howard available at tight end. In his second NFL season, Howard caught 34 passes for 565 yards and five touchdowns before an ankle injury ended his 2018 campaign prematurely. In his 14 previous seasons as an NFL offensive coordinator or head coach, Arians has had only three tight ends who exceeded the receiving yardage that Howard compiled in 10 games in 2018, and none of Arians’ past tight ends ever matched Howard’s per-catch average of 16.6 yards. During a press conference at the NFL Scouting Combine, Tampa Bay general manager Jason Licht said Howard had Arians excited about tight end. “When I pointed out O.J. to Bruce, one of his first days in the office, OJ was rehabbing out on the field,” Licht said, “and Bruce’s eyes got about this big, so I know he’s excited. Jenna Laine of ESPN has speculated that Arians might use Howard as he used wide receiver Larry Fitzgerald during his five seasons as coach of the Arizona Cardinals. Fitzgerald already had played nine NFL seasons when Arians arrived in Arizona in 2013. Under Arians, Fitzgerald often lined up in the slot, ran routes like a “glorified tight end” and caught plenty of passes. In Arians’ five seasons with the Cardinals, Fitzgerald caught 470 passes for 5,132 yards and 33 touchdowns. He caught at least 107 passes in each of the final three seasons. 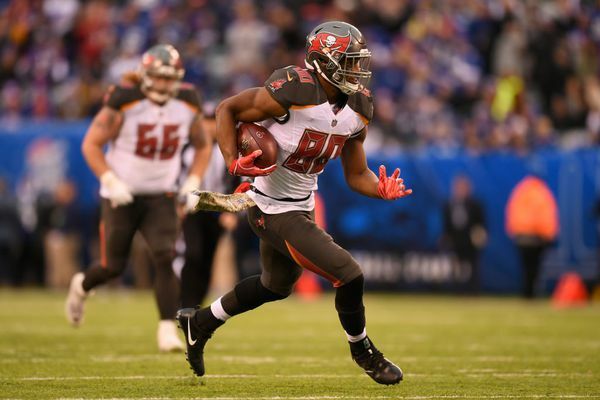 After the Buccaneers selected Howard with the 19th choice in the 2017 NFL Draft, he caught 26 passes for 432 yards and six touchdowns as a rookie. In 2018, Howard was on pace for 904 receiving yards when he was injured. The Tampa Bay single-season record for receiving yards by a tight end is 884 by Kellen Winslow II in 2009. Both of Howard’s NFL seasons have ended early because of ankle injuries, and each injury came when he was tackled after a big play. In 2017, it was a 30-yard touchdown reception. In 2018, the injury occurred at the end of the 24-yard gain. Even though he missed six games, Howard finished 14th in receiving yards among the NFL’s tight ends in 2018. Howard’s average of 56.5 receiving yards per game was exceeded by only three tight ends — the San Francisco 49ers’ George Kittle, Kansas City Chiefs’ Travis Kelce and Philadelphia Eagles’ Zack Ertz (the three tight ends with 1,000 receiving yards in 2018) — and none of the tight ends ahead of him in receiving yards could match Howard’s average gain of 11.77 yards per target, thanks to a 70.8 percent catch rate. Before playing on Alabama’s 2015 CFP national-championship team, Howard earned All-State recognition three times at Autauga Academy — as a linebacker in 2010, in the athlete slot in 2011 and as a tight end in 2012. Pittsburgh quarterback Ben Roethlisberger threw for 353 yards and three touchdowns in the Steelers’ 30-27 victory over the Tampa Bay Buccaneers on Monday night. But Tampa Bay coach Dirk Koetter isn’t down on the Bucs’ secondary, particularly rookie cornerback Carlton Davis. By the time Tampa Bay selected Davis from Auburn with the 63rd choice in the NFL Draft in April, eight cornerbacks already had been chosen. Three weeks into the season, only one of those cornerbacks has played more than Davis. As a starter in every game this season, Davis has been on the field for 93.8 percent of the Bucs’ defensive snaps — 196 of 209. The only one of the cornerbacks drafted before Davis who has played more than the former Auburn standout this season was the first to come off the board — Denzel Ward, who went to the Cleveland Browns with the fourth choice. Ward has played 98.6 percent of the Browns’ defensive snaps. But Davis’ workload is in danger of a decline on Sunday, when Tampa Bay visits the Chicago Bears. Davis showed up on the Buccaneers’ injury report as a limited participant in Friday’s practice, and a groin problem has him listed as questionable for Sunday’s game. Davis’ absence would be another blow for the Tampa Bay secondary. 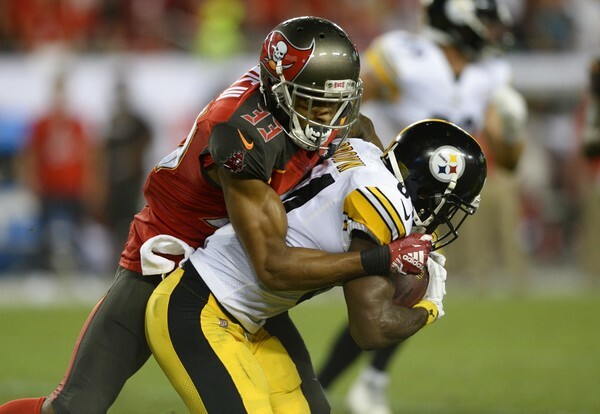 Starting cornerback Vernon Hargreaves has gone on the disabled list with a shoulder injury, and starting safety Chris Conte joined him this week after getting hurt against the Steelers. The Bucs’ other projected starting cornerback, Brent Grimes, got on the field for the first time this season against Pittsburgh. The injuries have contributed to Davis’ quick climb into the lineup and also brought two other rookies, cornerback M.J. Stewart and safety Jordan Whitehead, onto the field against Pittsburgh on Monday night. In addition to Roethlisberger, Tampa Bay’s young secondary faced Drew Brees in a 48-40 season-opening victory over the New Orleans Saints and Nick Foles in a 27-21 win over the Philadelphia Eagles on Sept. 16. When Davis joined Tampa Bay, Koetter cited the cornerback’s size as one of his most attractive attributes, particularly important with the Bucs facing big receivers Julio Jones of the Atlanta Falcons, Devin Funchess of the Carolina Panthers and Mike Thomas of the Saints twice each season. But against the Steelers, Davis often matched up with wide receiver Antonio Brown, who’s 5-foot-10 but also a four-time All-Pro. Brown finished Monday night’s game with his smallest stats of the season with six receptions for 50 yards, but he did catch a touchdown pass. The Buccaneers and Bears are scheduled to kick off at noon CDT Sunday at Soldier Field in Chicago. While Tampa Bay’s 2-1 start could be considered a little surprising with quarterback Jameis Winston missing the three games while serving an NFL suspension, Chicago also is 2-1 for the first time since 2014 and is the only NFC North team with two victories this season. 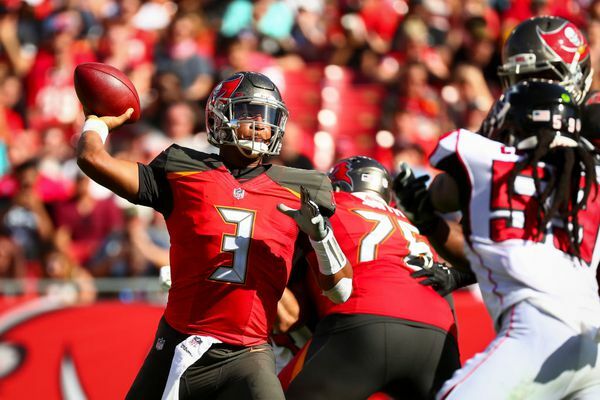 TAMPA, Fla. — Up until last week’s game against the San Francisco 49ers, the Tampa Bay Buccaneers hadn’t seen the return on investment they were expecting from their 2018 draft class. Defensive tackle Vita Vea, the Bucs’ No. 12 pick, notched his second sack and three tackles for a loss against the 49ers, and strong safety Jordan Whitehead turned in a team-leading 11 tackles (10 solo) and two pass breakups, suggesting there is some hope with this rookie group after all. Prior to his breakout performance, Vea had recorded just three tackles and one sack in eight games, a tough pill to swallow for Bucs fans who instead were clamoring for former Florida State’s Derwin James. The Los Angeles Chargers drafted the safety at No. 17 and he is a strong contender for NFL Defensive Rookie of the Year. Vea’s pro career got off to a rough start when he missed all of training camp and the first three games of the regular season with a strained calf muscle. He also had to trim 15 pounds from his 347-pound frame, a concern for some teams ESPN spoke to prior to the draft. Vea credits Sunday’s performance, which included plowing through All-Pro offensive tackle Joe Staley, to “not thinking so hard” for the first time this season. As for Whitehead, the Bucs’ fourth-round pick, he has had to step up as the Bucs have been without starters Chris Conte (injured reserve) and Justin Evans (toe). Whitehead also was dealing with injuries, including a hamstring strain and a concussion, which he had to clear the protocol in a week’s time in order to play last week. Davis also gave up a 41-yard catch to Odell Beckham Jr. two weeks ago. Against the Carolina Panthers, he drew a costly 15-yard penalty for taunting after getting in Devin Funchess’ face after a fourth-down stop. To make matters worse, Christian McCaffrey leaped over Davis during a 32-yard gain; and on the very next play, Davis surrendered a 32-yard gain on an end around by DJ Moore. Davis has three pass breakups and has yet to record an interception, but as the game starts to come to him, the hope is that he can use his physicality at the line of scrimmage and his length to counter the NFL’s big-bodied targets. Cornerback M.J. Stewart has missed the past four games with a foot injury, but he also has had his share of rough moments, as has second-round running back Ronald Jones II with a hamstring injury. Prior to Jones’ injury, he was a healthy scratch the first three games, and his longest run was for 9 yards against the Browns. Offensive guard Alex Cappa, a third-round draft pick out of Humboldt State, saw his first game action last week and performed, according to Koetter, “like a guy getting his first NFL snaps.” Meanwhile, wide receiver Justin Watson has primarily been used on special teams, the result of the Bucs’ depth at the position. Vea has three starts this season, Davis has 10 because of Hargreaves’ injury and Whitehead has six because of Conte’s injury. A closer look at other NFL teams’ recent drafts (or even the Bucs’ own 2016 class) suggests it could be worse. Injuries wiped out the Patriots’ four-person draft class in 2014. Of the New York Jets’ picks through the first four rounds in 2014, just one remains on the roster. The Philadelphia Eagles’ first three picks in the 2011 draft — guard Danny Watkins, safety Jaiquawn Jarrett and cornerback Curtis Marsh — combined for just 20 starts in three seasons. So while Tampa Bay’s pedestrian production from its 2018 class is not ideal, it is far from a worst-case scenario. Local Tampa Bay sports show host Tom (TKras) Krasniqi ruffled some feathers this morning with what many took as an outlandish idea that something big was brewing with the Buccaneers. Fans weren’t too pleased with the comment found in the tweet below and reacted as many would expect, wildly out of control. But what if the team did contemplate a decision like this? After all, many have felt Gerald McCoy is on his way out due to a combination of age and salary. So why not David? Lavonte David is the premier linebacker in Tampa Bay and has been so since his arrival out of Nebraska. Taking a quick look at his contract can quickly explain why such a comment from Krasniqi would seem feasible, with zero dead cap if cut, David essentially clears $ 10 million in cap space on his own if cut ($9.75m to be exact). David is nearing age 30 and if the team were going all out rebuild, his age and contract would certainly make him a potential cap casualty for a team looking to go young and accepting lesser play at the linebacker position. In Tampa Bay however, that isn’t the case as Bruce Arians and Todd Bowles are looking to come in and turn things around quickly. David returned to form a bit this past season as a multidimensional defender. David was again getting into the opposing teams backfield, as evidenced by his 4 sacks, 3 QB hits and 3 hurries. In a defense under Todd Bowles now that will heavily favor pressuring with the blitz and moving it’s linebackers around, David is the exact weapon this staff should be looking to use behind the defensive line. David’s production and veteran presence should negate the idea of the team cutting him however the contract situation does potentially give the team some leverage to potentially pressure David and his agent into a restructured deal at a lower cost to help the team as it heads into this free agency period. 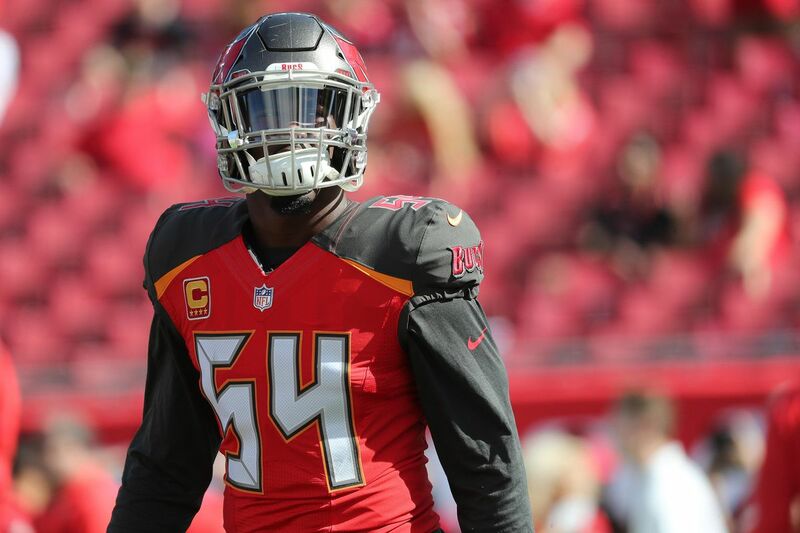 Another angle to think about is the realistic possibility that the staff has reviewed all of the film and determined that Kwon Alexander (should he be re-signed) can lead an interior linebacking group without Lavonte David. David is an undersized outside linebacker and with the team presumably moving to a 3-4 dominant scheme, David is vastly undersized by typical standards for an interior linebacker in most 3-4 base defenses. A look at the Jets roster though could potentially dispell this as a theory, especially for a team that went out and nabbed themselves a guy in Darron Lee, who like Lavonte David, was considered a bit undersized at the time. Lee of course, has paled in comparison to Lavonte David from a statistical stand point over the past few seasons. Whatever the Buccaneers decide to do when it comes to the teams salary cap, the way they handle it will be interesting. With an exciting feel to this off-season with the hire of Arians and company, it’s quite possible that some of the veterans are willing to work around some figures to ensure they are here in Tampa Bay to help turn this ship around and set sail into the playoffs once again. It would be tough to see this team turn things around without the likes of Gerald McCoy and Lavonte David, both of whom have dealt with turmoil on defense with a slew of bad coaches and poor results. McCoy and David have earned their right to call their own future and both deserve to be here for this potential turnaround year under Bruce Arians’ guidance. INDIANAPOLIS — Bruce Arians sees no reason why defensive tackle Gerald McCoy won’t return for his 10th season with the Bucs. “You see him under contract and that’s a heck of a player they still have to game plan for, so I hope so,” Arians said. According to Arians, even though the Bucs are going to a 3-4 scheme, McCoy should be a perfect fit for the defense under new coordinator Todd Bowles. McCoy has had 12 sacks in the past two seasons and saw his streak of six consecutive Pro Bowl appearances snapped in 2018. His numbers weren’t overwhelming: six sacks, 28 tackles and 21 quarterback hits. However, McCoy will earn $13 million this season in non-guaranteed salary. RELATED STORY: Are the Bucs really planning to keep DeSean Jackson? Bucs general manager Jason Licht sounded a lot less committed to McCoy returning in 2019. What could change that? Perhaps the draft if the Bucs use their No. 5 overall pick on a defensive tackle. Indianapolis will always be a special place for Arians, who went 9-3 as an interim coach for the Colts after taking over for Chuck Pagano and was named the NFL’s Coach of the Year in 2012. That performance led to his first NFL head coaching job the next year with the Arizona Cardinals. After retiring for a year, Arians was completely back Wednesday for the unofficial start of the 2019 season at the NFL Scouting Combine. He participated in a jobs in football for women forum in the morning, then held a media session around noon before interviewing prospective draft picks the rest of the day. Of course, Arians feels a special connection to the Colts, where he had two stints as an assistant coach. Player notes: The Bucs believe Ronald Jones just needs some more confidence after a tough rookie season in which he rushed for just 44 yards on 23 carries (1.9 avg.) and a TD while adding seven receptions for 44 yards. “It seemed like every time he got the ball somebody was catching him right in the backfield,’’ Arians said. “Having seen him, knowing a little bit about him in college, he’s a very talented guy. He’s a young player and has got some room to grow maturity-wise but talent-wise, his opportunities were slim and none but he showed flashes of what he can do.’’ … Arians also loves RB Peyton Barber. “For a man that size, when you watch the tape, you don’t think he’s 230. You think he’s a 205-pound running back. He’s got great feet. When we’re building something, that’s someone I want to build around.’’ … Cornerback M.J. Stewart will move to safety next season and guard Caleb Benenoch will focus on playing right tackle … offensive lineman Alex Cappa will concentrate on guard.